Continental's Attack Comp Tubular is a new breed of race tire. It's specifically designed for the front wheel, using a narrow 22mm contact patch for efficient aerodynamics and pressie handling. The Black Chili compound uses smaller carbon particles which have more contact points for improved grip and the ability to form more easily around imperfections in the road surface for lower rolling resistance. The smaller particles also fit closer together for longer tread life. The Vectran breaker wards of flats but is also supple for less rolling resistance and greater comfort than other puncture resistant barriers. 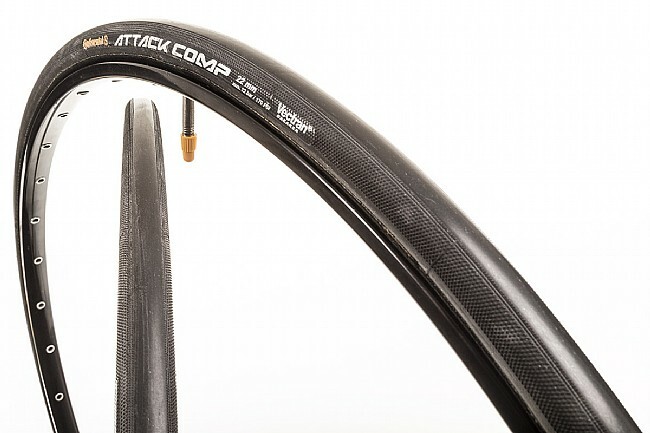 The Attack Comp Tubular Tire is available in 700c x 22mm (22-622 ISO) and features a 3 ply casing for a total of 180 TPI. 115-170 recommended PSI. Claimed weight: 240 grams. Black. For use with tubular rims only. The Attack Comp is designed to be paired with the Force Comp tire on the rear wheel.